In his annual end-of-the-year press conference, the Russian president answered questions on Ukraine, exiled oligarch Mikhail Khodorkovsky, the collapse of the ruble and the possibility of a coup, though the session was dominated by economic issues. According to Putin, the financial problems currently being experienced by Russia are only temporary and will pass. Russian President Vladimir Putin dismissed fears of economic turmoil at his 10th annual end-of-year press conference on Dec. 18, saying that the value of the ruble, whose fall, in his words, is due to "external factors," will recover, while the Central Bank and the government are acting "correctly" in response to the situation. During the session, which lasted for three hours and 10 minutes and was attended by 1,259 representatives of Russian and world media, the president responded to a range of questions on topics as diverse as the Ukrainian conflict, the ruble crisis, the definition of a “fifth columnist,” and even his love life. In this period 38 representatives of Russian and foreign media were able to ask the head of state a total of 53 questions. As had been expected, most of the questions concerned the Russian economy after the sanctions (about ten questions were asked on this subject) and about international problems (11 questions). 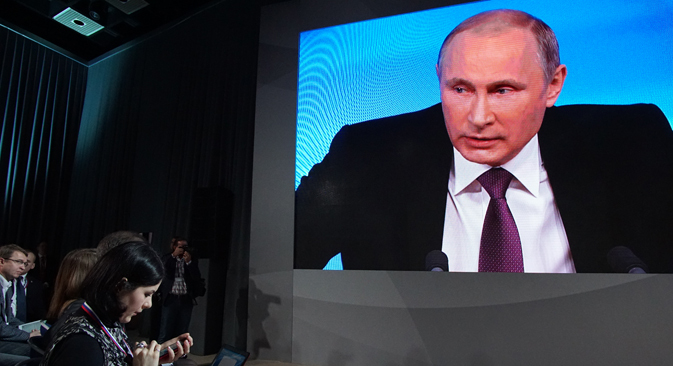 However, Putin also fielded a number of sharp-edged questions from the assembled journalists. For example, he commented on the political aspirations of oligarch Mikhail Khodorkovsky, who had spent ten years in jail, as well as on the possibility of a coup in the Kremlin. One of the most trenchant questions was asked by a journalist from the Ukrainian publication UNIAN, who was wearing a sweater with the word Ukrop, which means ‘dill’ in Russian (ukrop, due to its similarity to the Russian word Ukrainets, a Ukrainian, has become a popular term for Ukrainian patriots on social networks). The journalist asked Putin how many soldiers and how much military technology the Russian president had sent to southeastern Ukraine, where the Donbass militias and Ukrainian forces are still fighting. "All people who follow the call of their heart and do their duty or voluntarily participate in combat, including those in southeastern Ukraine, are not mercenaries, they do not get paid," replied the Russian president, though he did not directly answer the question. "The fact that the Ukrainian journalist was given the right to ask Vladimir Putin a question says that the president had been prepared to respond to even the most pointed questions and hear acrimonious comments," wrote Kommersant journalist Maxim Yusin. "The question was indeed severe. But so was the response. Putin accused the Ukrainian government of using multiple rocket launchers and air power against their own people." A whole series of questions was dedicated to the economy. Putin expressed his hopes that the ruble would strengthen and that the decrease of foreign currencies against the ruble seen in the last two days would remain. However, he did not exclude that oil prices will continue falling in the near future. This, in his view, will influence the national currency, as well as other factors, such as inflation. "After the recent shocks on the foreign exchange market and the bad news from the stock market, the president's words brought a positive mood to the business community," says Dmitry Kravchenko, president of the Presidium of the Young Entrepreneurs Association. "This is yet another signal after the federal message, in which the president spoke of the capital amnesty, of the moratorium on changing tax rates and of the tax holidays. All this demonstrates the government's will to help business develop in the current economical conditions." Chief economist at Uralsib Capital Alexei Devyatov does not exclude that the revival of the Russian economy will last about three years, and warns that in 2015 he expects "a rather serious recession" in the country. "The revival will begin, but if we want to restore the economy to the GDP level that we had in the beginning of 2014, then all estimates show that we will exit the crisis at best towards the end of 2017," said Devyatov. "We will reach the levels that we had at the beginning of this year somewhere in the beginning of 2017. That is why I say a bit more than three years." Putin also answered a question about the 2018 elections. He stated that his decision to run for president would depend on the general results of work carried out in the country in various areas. The head of state underlined that it was too early to think about the 2018 presidential elections for anyone and that it is fundamental now to work in the interests of Russian citizens. Opinion: What awaits Russia’s economy in 2015 after ruble collapse? On the whole, Russian commentators saw nothing sensational about the press conference and said that Putin had been consistent in his rhetoric. "There were no sensations," wrote President of the Institute of National Strategy Mikhail Remizov on social networks. "This says that the government and the Central Bank will not make any changes to the financial policy. The president did not speak about any cardinal economic initiatives or any signs of an economic turnaround towards a more mobilized financial-economic model." "My general impression of Putin's press conference is that he is calm, that there is no feeling of crisis - he makes jokes, tries to approach each problem from various angles - and that he can courageously face any issue," wrote Director of the International Institute of Political Expertise Yevgeny Minchenko on his Facebook page.